Cusco, Peru, the former capital of the Inca Empire, is easily one of the country’s most beautiful and magical cities. After more than two months traveling the length of Peru from north to south, we finally arrived in this famous city. 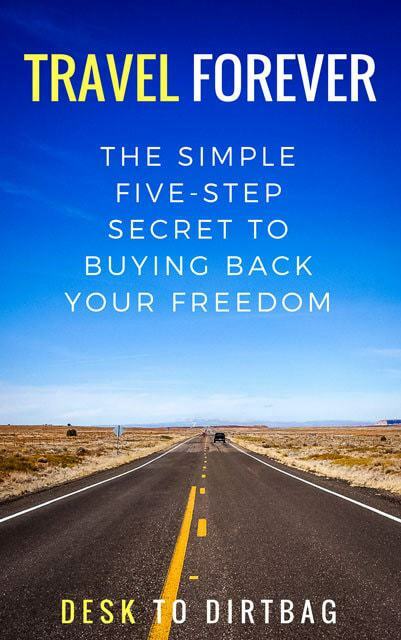 I wasn’t sure what to expect before visiting… I knew it was the tourist capital of Peru, but I wondered if it was all hype due to its proximity to Machu Picchu, with many travelers simply using it as their launch pad for other adventures. I’m happy to say that not only is Cusco worth exploring for its own sake, but that it is one of the most amazing, beautiful, entertaining cities we visited in all of Peru — a wonderful mix of Inca ruins, colonial architecture, and modern amenities. 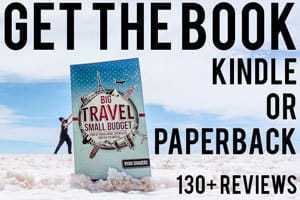 It has a little bit to offer any traveler. 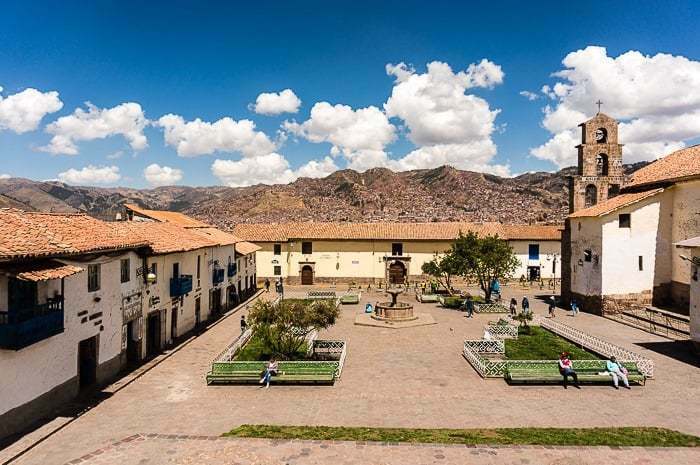 The weather in Cusco, Peru is very agreeable, thanks to its high elevation of 11,152 feet. Although that means it can get a little chilly at night (so bring a jacket). It’s also worth mentioning that for a city of this size it has a fairly good track record when it comes to safety and security (although you should always take precautions in any Latin American city). 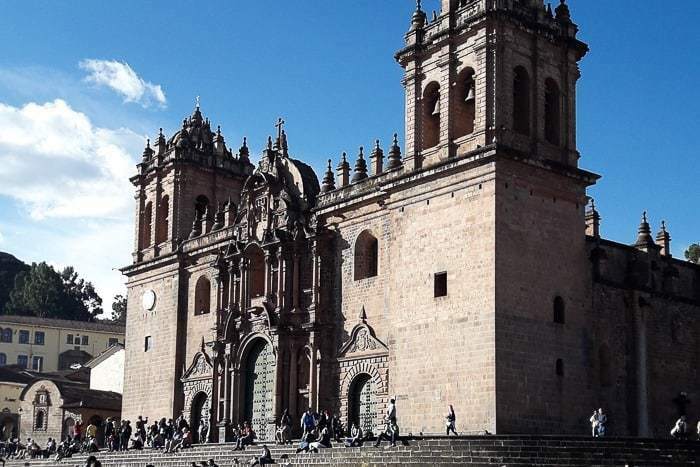 Cusco is a place I would happily consider settling down in for a few months, and it would make an excellent home base for those looking to study Spanish or for opportunities to volunteer in Peru. Here are my suggestions on things do in Cusco, Peru in order to maximize your time in this incredible city. 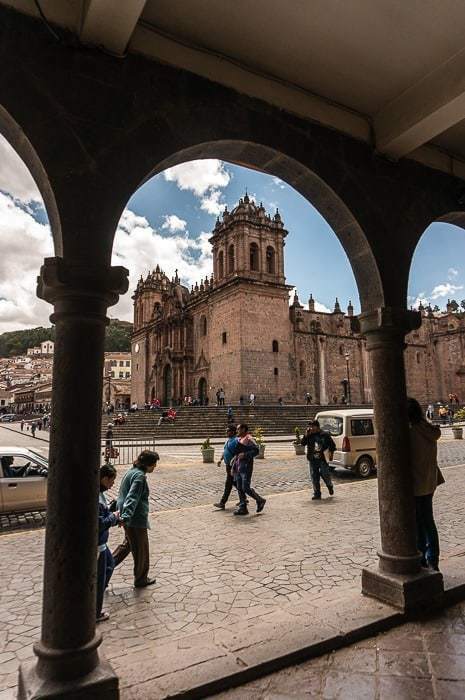 The Plaza de Armas is the central hub within Cusco, as it is with most cities in Peru. It is a large square plaza surrounded by incredible architecture, and the imposing cathedral (more on that later). There isn’t anything in particular to do here, it’s just a beautiful setting where you can people watch, sit in the park, or enjoy a coffee or meal at one of the locales on the second floor that surround the plaza. 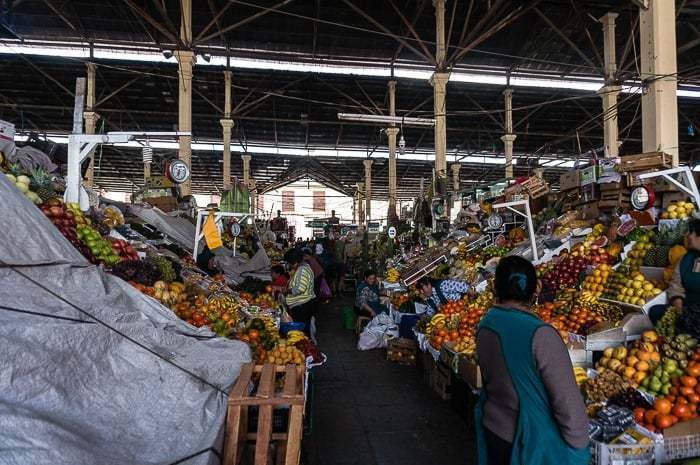 If you’ve never had the chance to visit a local market in Latin America (or even if you have), it’s definitely worth a visit to explore the bustling San Pedro Market just a few blocks west of the Plaza de Armas. 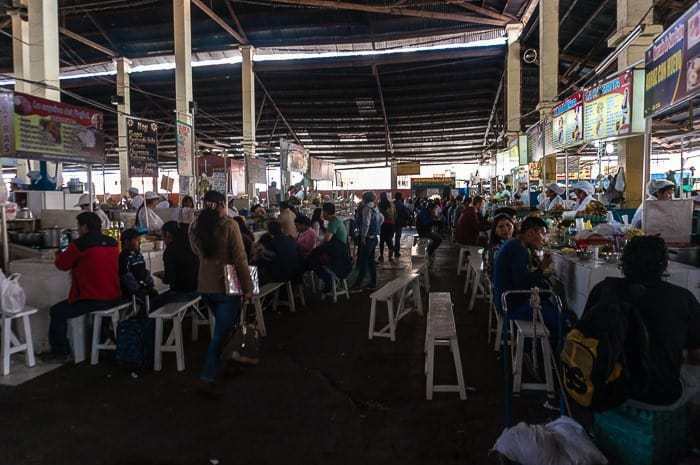 Here you will find, well, pretty much everything from fresh fruits and produce, to cuts of meat, to potatoes you never knew existed, to colorful textiles and souvenirs, to cheap and filling lunch options. It’s a sensory overload as you wander through the busy market and a great place for photos. At the least, you’ve got to pick up a fresh juice here. If you’re looking for something with a little more punch, you must try a pisco sour, the national drink of Peru. Pisco is a liquor made from distilled grapes. The pisco sour was invented in Lima and consists of egg whites, lime juice, simple syrup and bitters. It’s a tasty little cocktail, but be wary that alcohol can hit you harder thanks to the altitude and can hinder your acclimatization. Ancient Cusco (or Qosqo) was supposedly designed in the shape of a Puma, with the current Plaza de Armas sitting at its heart, the (current) old city making up the body, and Sacsayhuaman making up the head of the Puma. This massive fortified complex high on the hills overlooking Cusco is the most significant ruin in town. 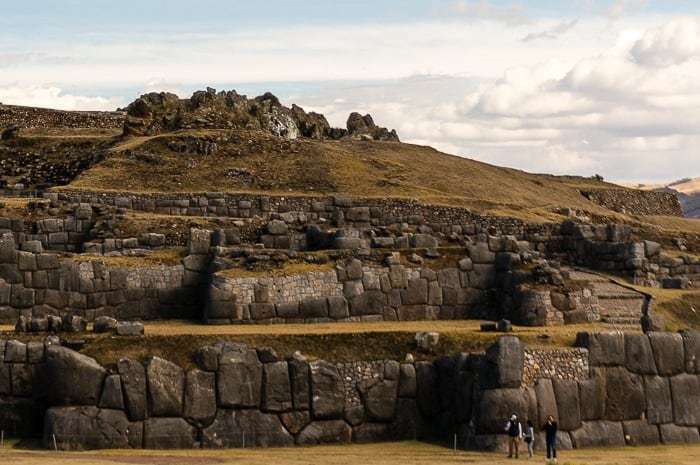 Here you will see the intricacy and genius of the ancient Inca stone work as they carved immense boulders into shapes that fit precisely together. Just imagine that what remains today is only 20% of the original structure since many stones were hauled off to build the churches of the Conquistadors in downtown Cusco. 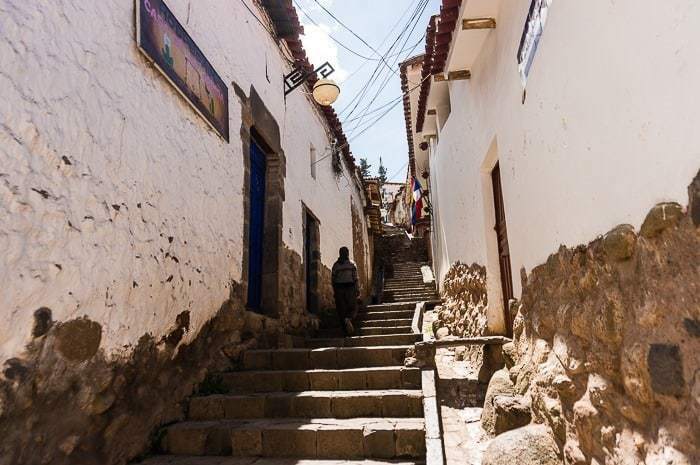 Lying in the hills east of the Plaza de Armas are the narrow streets of San Blas. This is the heart of the local artistic scene, what you might consider the trendy neighborhood, full of great restaurants, cafes, galleries and more. 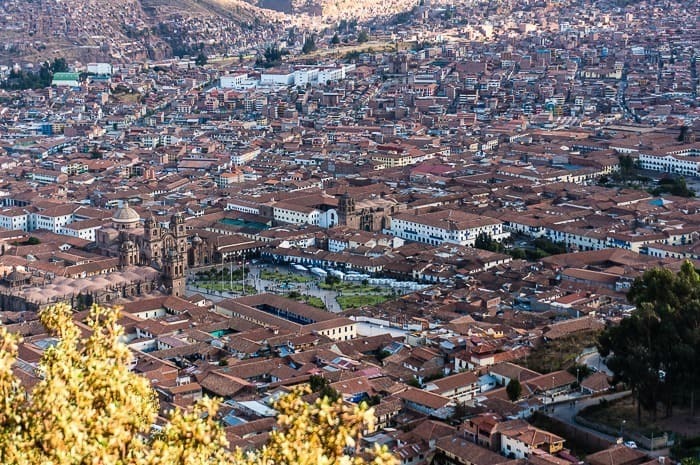 It’s fun to hike up the steep streets, pop in for a cafe, or simply enjoy the stunning view of Cusco from the viewpoint. If I was going to live in Cusco, it would definitely be in this neighborhood. Take a break from city life and go for a short day tour to the fascinating Maras salt ponds. These open air salt ponds have been in use since pre-Inca times, and are a place where local families can harvest salt. The salty water of an underground spring is fed into the many hundreds of pools were it evaporates under the hot sun, eventually leaving behind salt crystals of various sizes. They can then scrape the pool and gather the salt. It’s an incredible feat of engineering, and a surreal place to visit. 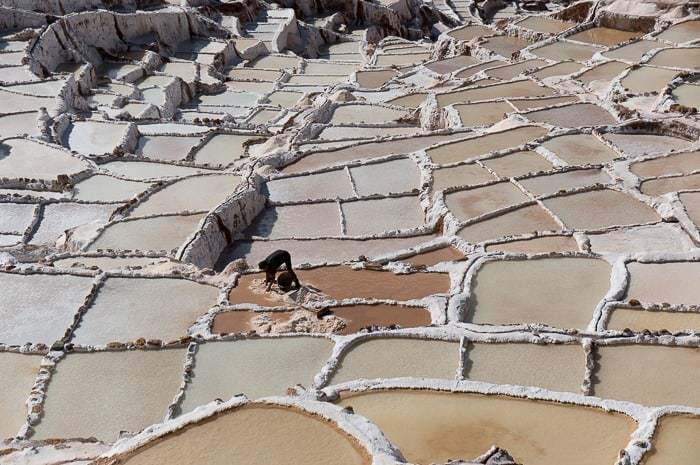 Read more about the Maras Salt Ponds. One of the best ways to get a general overview of a city upon arrival is to hop on a local tour. 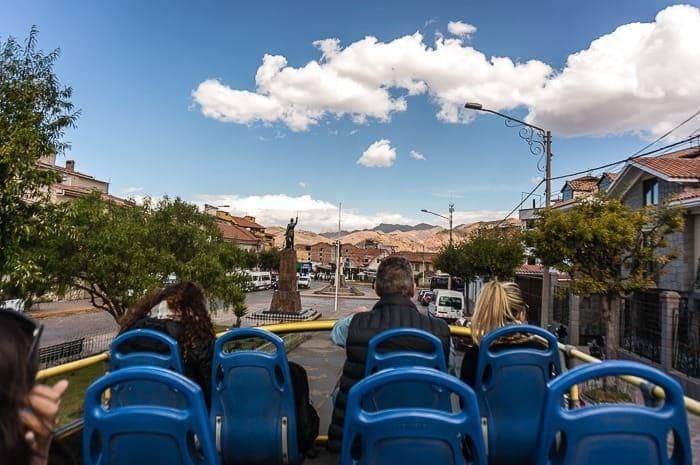 The open air, two story buses make for a quick, cheap, and interesting introduction to Cusco. They will take you through the downtown core, take you to the main sites and explain their backstory, significance, and more. 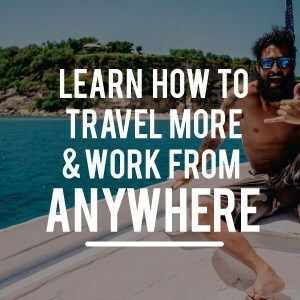 There are a few different companies, but they only cost around $10 per person and the tour will last a good three hours or so and give you an overview of the city and an idea of which places you would like to further explore. You can find people selling tickets around the Plaza de Armas. Yes, you can snack on the classroom pet, a guinea pig, or the friendly cousin of the llama, an alpaca. These are local delicacies and are something you shouldn’t miss if you aren’t squeamish or a vegetarian. Alpaca is often served up like a steak or in a hamburger, so it is more easily palatable than the cuy (guinea pig) which is typically served up whole, complete with hands and a big toothy grin. But if you’re not into eating strange things like this, no worries, Cusco has an incredible dining scene with top notch restaurants and is a great place to try more traditional Peruvian fare like pollo saltado (so good!) or papas a la huancaina (to die for!). Who says you need to go to Rio? 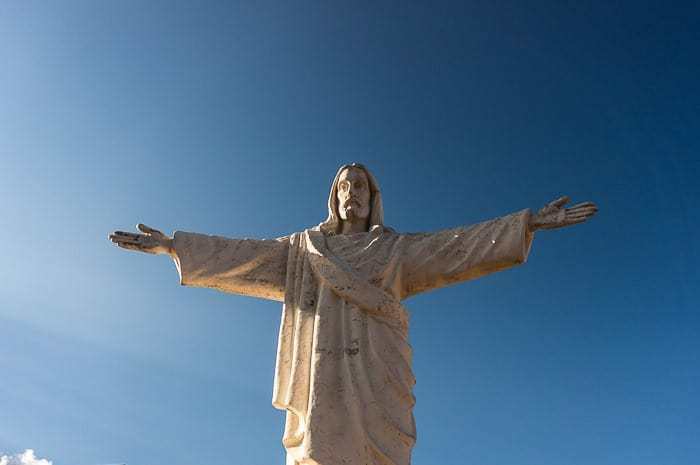 High above Cusco, near the ruins of Saksayhuaman, is a large statue of Jesus Christ with his arms outstretched. You can’t miss the statute at night since it is lit up and visible from all corners of the city. The statue was actually the gift of the Palestinian community, oddly enough. The real reason to visit is actually for the great vista offered of the city. The San Francisco Church and Monastery sits near the market of San Pedro, and makes for an interesting visit, even if you don’t particularly enjoy churches. The church was constructed in the late 1500s. While the exterior isn’t overly spectacular, it does house a number of interesting sights inside. Highlights include the incredibly ornate, carved wood choir, two crypts housing human bones arranged in patterns, and great collection of colonial art, including a massive 40 foot by 30 foot painting depicting the entire lineage of St. Francis de Assisi. 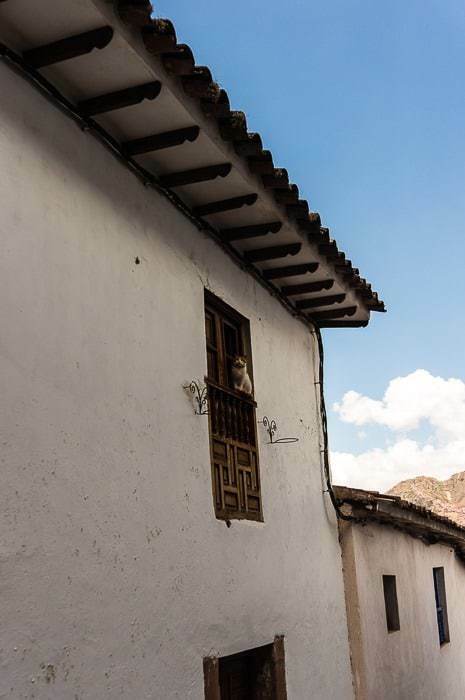 No site best represents the volatile history of Cusco like Santo Domingo. Once the site of an important Inca site known as the Sun Temple, where the walls were lined with gold. All of that gold was, of course, robbed by the conquering Spanish, who decimated the local population and everything they could get their hands on. 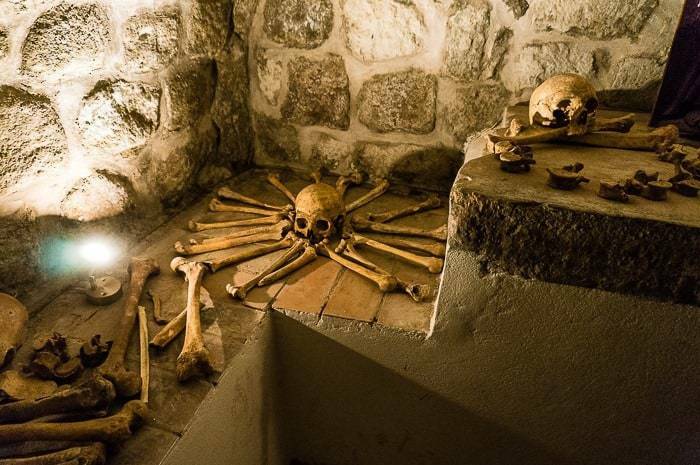 All that remains today is the foundation of the Sun Temple, upon which the Spanish built the church of Santo Domingo, co-opting important religious and ceremonial sites of conquered peoples — a tactic used all across Latin America. Coffee in Peru is pretty bad. To be fair, it isn’t just Peru, but also surrounding countries as well. They export their best stuff to foreign markets and drink lousy coffee locally. 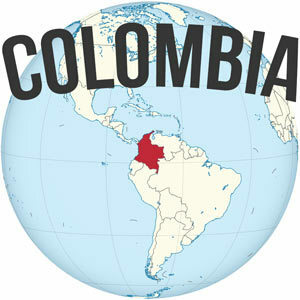 In Peru it is usually café pasado – a stale jug of cold coffee that they mix with hot water. Meh – not the worst, but not good. 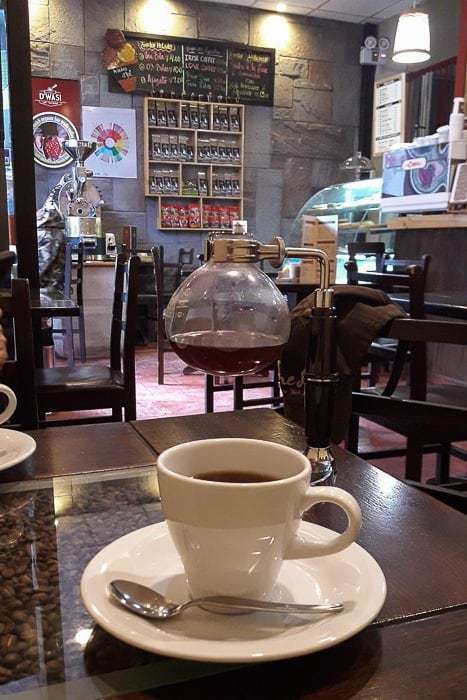 Thankfully, Cusco has a number of real coffee places where you can get espresso drinks, Aeropress, or even siphon coffee. One of my favorite places was Café D’Wasi which is locally run and features some of the best brewing methods in the city. 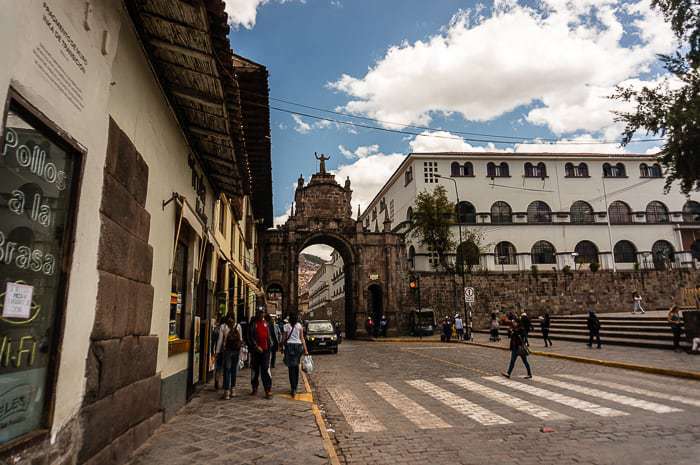 If you’re not adventurous, you can even find a Starbucks right along the Plaza de Armas. This might not sound like a big deal if you’re in Cusco for a short visit, but you try going months traveling across Peru and only getting café pasado. The Cathedral is the main attraction along the Plaza de Armas. 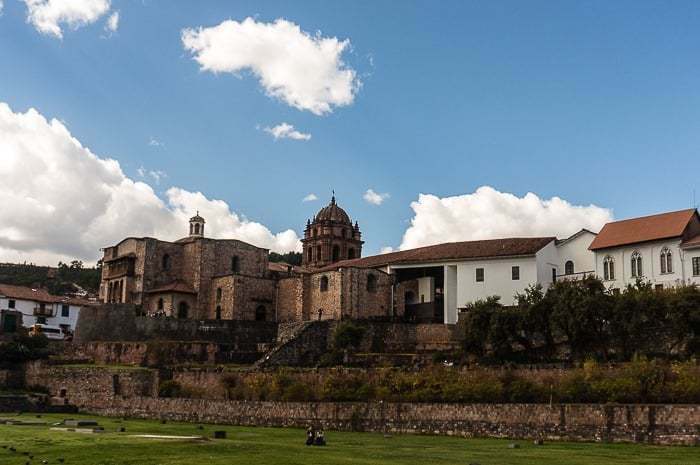 It was constructed in the mid 1500s (on top of the ruins of an Inca palace) and is a stunning example of a Renaissance-style church. The Cathedral is filled with works of art from the Cusco School in the 16th and 17th century, but the unique feature of the art is that it is decidedly European in form, but incorporating many local traditions or elements. For instance, there is a painting of the Last Supper of Jesus Christ, but the apostles are dining on cuy (guinea pig) in this supper. 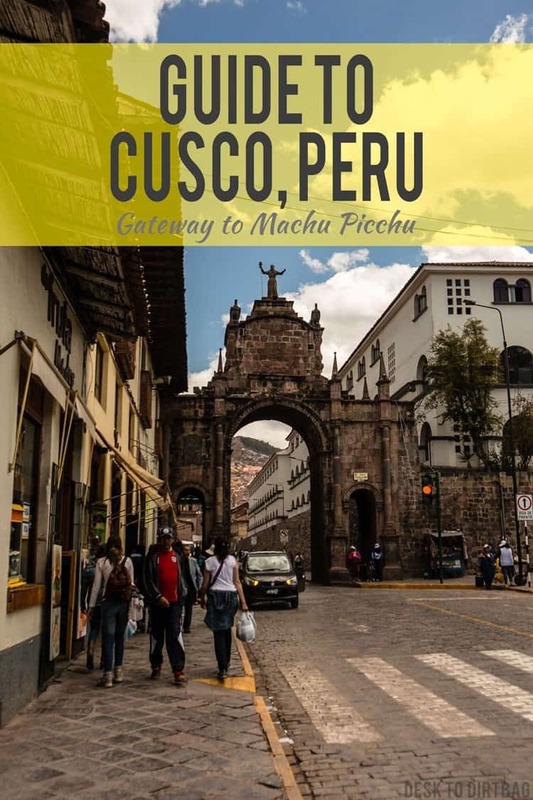 Let’s be honest, you’re in Cusco to visit Machu Picchu, right? Even if it’s a last minute trip, you can often score tickets for Machu Picchu a day or two in advance from the ticket office near the Plaza de Armas. Hopefully you’ve booked well in advance if you plan to hike the Inca Trail, or take a luxury train to Machu Picchu. If not, you can still find ways to visit Machu Picchu on a limited budget — read my guide on the cheapest way to visit Machu Picchu. If we’re strictly speaking about a city itself and not considering the surroundings, I’d have to say that Cusco was my favorite city that we visited in three months in Peru and that is despite the heavy tourist traffic and the people hassling tourists on the street for tours, massages, etc. Cusco warrants a longer visit if you have time surrounding your trip to Machu Picchu, trust me! 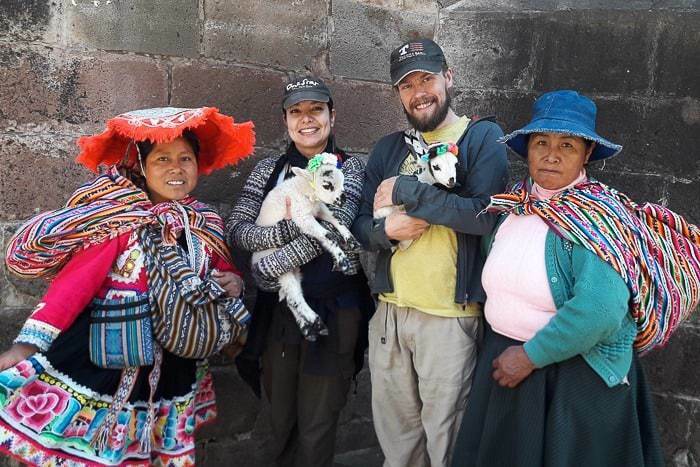 Traveling to Cusco on your next trip? Book the perfect room on Booking.com today!